At Johnny's we take particular pride in our Asian greens assortment. 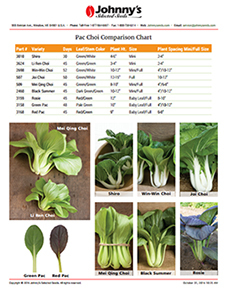 Years ago we noted a dearth of seed for growing Asian vegetables on this side of the Pacific. We began traveling to Asia to source seed for vegetables which at the time, to many, seemed exotic. Over the years we have continued our journey to develop a comprehensive assortment, to provide both home cooks and professional chefs with just about any green he or she may desire. To ensure top-notch seed quality, we established relationships with only the best suppliers, both domestic and Asian. 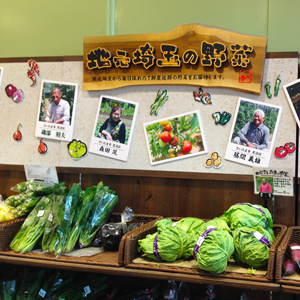 Local growers capture the limelight at a Japanese farmers' market. 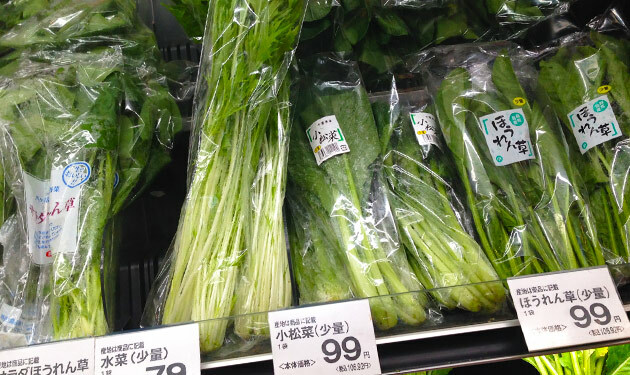 Whether you're provisioning at the supermarket (top image) or the farmers' market, in Japan, fresh greens take pride of place. This simple recipe showcases the mild flavor of the mizuna, and makes an excellent side dish. Heat wok or skillet over high heat for 1 minute, then add oil. Add Mizuna and cook for 1–2 minutes, until just tender but not overcooked. Season to taste with soy sauce or salt and serve. 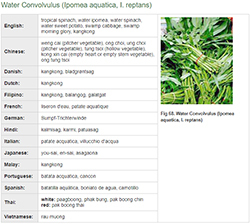 Note: The Mizuna also may be steamed for a few minutes rather than stir-frying. Bring a pot of water to a boil, add the choi sum and cook until just tender, about 45 seconds. Add garlic and stir-fry until it starts to brown. Add soy sauce and water and cook for 1 minute. Add choi sum, stir, and serve. Add garlic and cook until it just starts to brown. Add all of the spices and stir for about 30 seconds. Add ¼ cup water to the spices and mix. Add cabbage and cook until it reaches desired tenderness, adding water by the tablespoon if it becomes too dry. Note: This is a very flexible recipe. Some cook the mustard just a few minutes for a crisper version, while others cook it longer until it becomes tender. You can vary the quantities of spices or omit any that do not suit your taste. At a typical Korean restaurant, meals come with several — sometimes over a dozen — of these side dishes, known in Korean as banchan. Kimchee is always one of them. Steam or boil shungiku until tender. Drain, chop into 1–2" pieces, then transfer to a bowl. Heat a small pan (cast iron works best), add the sesame seeds, and cook over high heat until they begin to pop. Immediately add sesame seeds to shungiku. The seeds will quickly burn if left in the pan. Add sesame oil and salt, and mix well. Peel the thick skin of the celtuce and julienne it. Bring a pot of water to a boil, add the celtuce and cook until just tender, about 1 minute. Add garlic, ginger, and pepper to the wok and stir-fry until ginger and garlic just start to brown. Add celtuce and salt, cook for another minute, and serve.